Our trailer is ready for the next step: the tiny house frame! 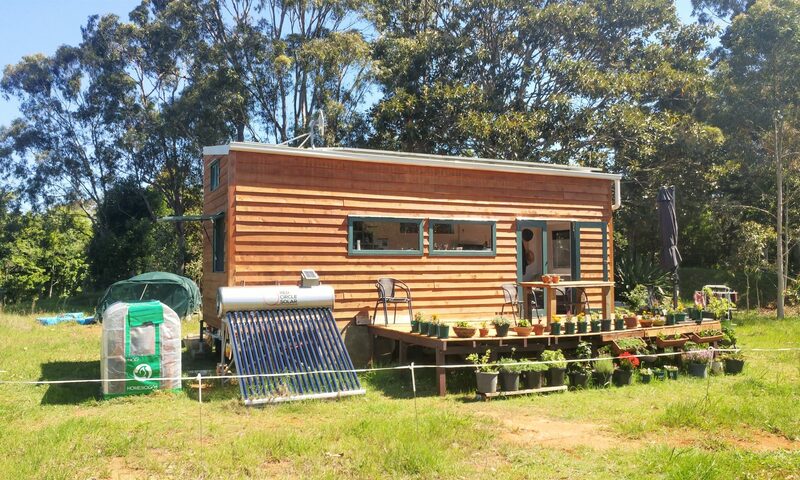 We’ve finished laying the wooden floor onto our tiny house trailer and couldn’t be happier with the result. Now it’s time for the next step which is the tiny house frame! Our tiny house trailer will not look like a flat trailer for too much longer. 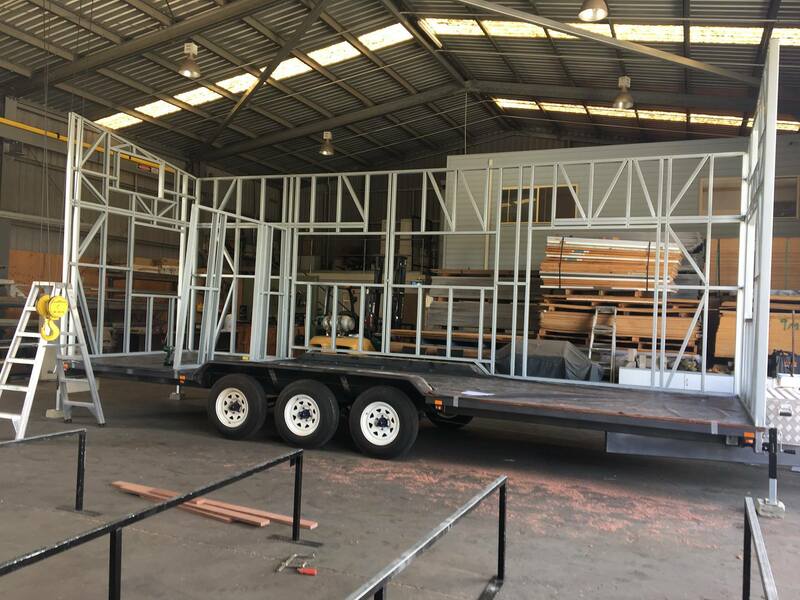 We are towing our trailer up to Queensland to a steel frame company. Once we pick it up again the trailer will look a lot more like a house, a tiny house. We’re so excited about this!! One crucial aspect to think about when choosing a tiny house frame is weight. To be honest we think about the total weight of our tiny house all the time. Here in NSW, we aren’t allowed to go over 4.5 t, so we try to keep that in mind, especially when choosing building materials. 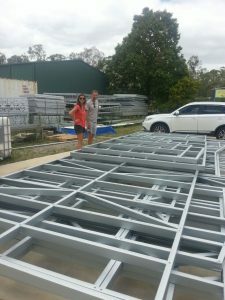 We decided to use steel for our tiny house frame because it’s quick and easy to assemble, it’s durable and lastly very affordable. It turned out though that the weight difference between timber and steel is not too tremendous. So to sum it up, a timber frame might be lighter than a steel frame but a steel frame is rock solid and won’t shift when moving the tiny house. But the overall weight of your frame also depends on the dimensions of your tiny house and the thickness of the steel. The thickness of our tiny house frame varies from 0.75 mm to 1 mm. In total, our tiny house frame weighs around 500 kg and it’s really solid. We’re very happy with our decision and can only recommend it. Photos by East Coast Steel Frames. 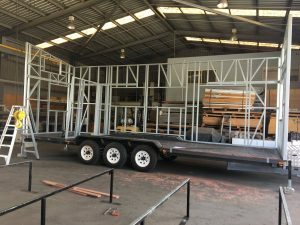 We used a company up in Logan, Queensland, for our tiny house frame. They are called East Coast Steel Frames and they have done an amazing job! Dean and his team were great, very helpful and really easy to deal with. They are using a system called FrameCad for their projects. This machine bends sheet metal into metal beams based on a special design software. Once the machine has spat out all the different beams they are assembled and bolted together. Done. It’s a great system that’s very efficient and cost-effective. With the steel frame bolted on our trailer actually looks like a house! We’re so stoked. This is just the most amazing moment. It’s awesome to see our vision come to life. Inside the frame, it actually feels spacious. Before it just looked like a long trailer but still felt smallish. Now we can see our lounge space, the kitchen and bathroom area and the best thing: all the windows. Our house will have so many windows and lots of light. It’s going to be great. I can’t wait to move in and to live in our tiny house. But there’s still a lot more to do…. Everything I’ve read tells me a steel frame is lighter than wood. I’m just about to frame my tiny house, I’ll do some calculations and get back to you. Hi Derek, thanks for you comment. How did your calculations go? How much was the framing? Did you two pay upfront or is there payment plans for that? Hi Scott, we paid $3000 for the frame including assembling. You have to discuss potential payment plans with your framing company. We would love to know the price you paid for the frame and trailer if you don’t mind. What are the dimensions of your frame? Thanks for mentioning the company that did it. We live in Qld and are looking at frames ourselves right now but don’t know where to start. Hi Lauren, thanks for your comment. We paid $3000 for the frame including assembling. The guys from East Coast Steel Frames did a really good job. Our frame is 2.4m x 8.1m. When it comes to the hight of the frame you have to consider a few things like road regulations, loft hight (if you have lofts) or trailer hight. The dimensions of your frame also depend on the size of your trailer. So, unfortunately, I can’t give you a precise answer because every tiny house frame and trailer is different. It looks great. How much was your framing? Currently wanting to go with a steel frame, but unsure of the costing vs timber. Hi Monty, thanks for your comment. We paid $3000 for our steel frame including assembling. Not sure how the price compares to timber since we always wanted to go with steel. Would love to know if you what material you ended up using for your frame. Previous PostPrevious We have finished laying the wooden floor on our tiny house trailer!